Rodeo Drive is so famous that you might think you know everything you need about it already. Unfortunately, many people get the wrong idea about it and end up unhappy that they went. This guide will help you separate fact from fiction and find out what to expect and what you can do. First things first. If you're talking about Rodeo Drive: the famous, fancy shopping street in Beverly Hills, don't sound like a clueless tourist. Learn how to say it right. It's not like the ROW-dee-oh where cowboys ride bucking broncos. Instead, it's pronounced roh-DAY-oh. You probably already know what Rodeo Drive is, but it's surprising how many people expect a different experience than what they get. Don't be one of them. Some visitors expect to see hordes of celebrities strolling the street, but in fact, you won't find many of the glitterati roaming around with shopping bags dangling from their arms. On a busy day, you'll probably meet more tourists than locals, more gawkers than shoppers. Other people go to Rodeo Drive thinking it's full of boutiques and local designers, but they find mostly the big, well-known brands instead. Others seem surprised that they can't find bargains and that prices are higher than in the discount stores at home, but think about it: What would you expect that in an area that has a reputation for being expensive? 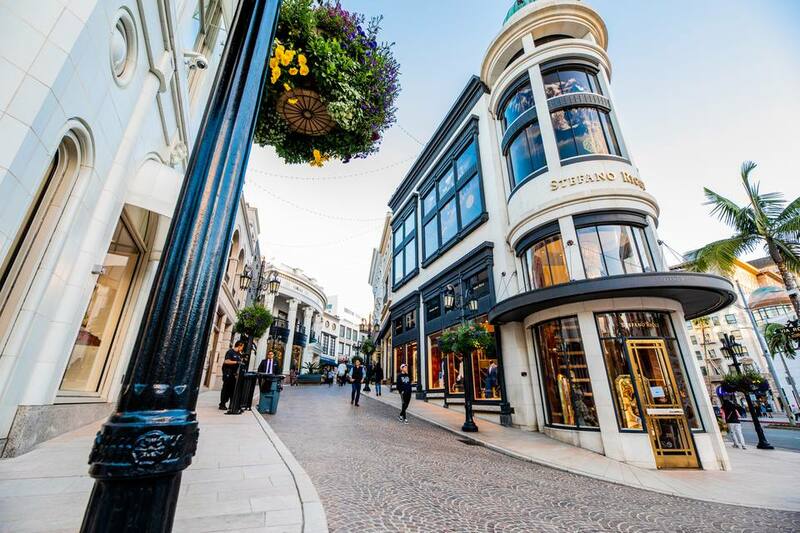 The most things to do on Rodeo Drive are window-shopping and people-watching, both of which are less damaging to the pocketbook than its intended activity: shopping. While the shops are expensive, don't worry about looking out of place. Tourists abound, clad in off-the-rack fashions, gawking just like you might be. Via Rodeo, a European-styled shopping concourse that resembles a movie set sits at Rodeo Drive and Wilshire Boulevard. It's the best place for an "I was there" photo, just below Via Rodeo sign. The rest of the street is understated, with single-story, simple shop fronts. A walk will take you past designer clothing shops by Armani, Gucci, and Coco Chanel; jewelers Cartier, Tiffany and Harry Winston; and exclusive couturiers where you need an appointment just to get in the door. The Regent Beverly Wilshire Hotel at Rodeo Drive and Wilshire is the place where characters Vivian and Edward — played by Julia Roberts and Richard Gere — found love in the 1991 film, Pretty Woman. The hotel's Lobby Bar looks out into Rodeo Drive and serves wine by the glass. They also host an afternoon tea that some say is best outside London. Architect Frank Lloyd Wright made his mark on Rodeo Drive, designing the Anderton Court Shops (333 N. Rodeo Drive). The building has changed from Wright's original design, but its triangular tower and spiral ramp are obviously Wright's style. And speaking of architecture, contemporary architect Richard Meier (who designed the Getty Center) created the Paley Center for Media at 465 N. Beverly Drive. If your stroll leaves you wanting to see more of Beverly Hills, meet the Beverly Hills Trolley at Rodeo Drive and Payton. A small fee is charged and their hours are on their website. This tour is more fun and informative than the sometimes-schlocky tours that leave from Hollywood Boulevard — and less expensive, too. The Rodeo Drive legend is much bigger than the street itself, and visitors often marvel at how small the shopping area is. It stretches from Sunset to Wilshire, but the Holy Grail of Shopping section is only three blocks long. It's a fun place to visit for a few minutes. It doesn't cost anything to window-shop, parking is free, and the spectacle is fun to watch. But if you're bargain-hunting, you need to go somewhere else. You can also spend a day — or an entire weekend — in Beverly Hills and West Hollywood. Here's how to do that. Just around the corner from Rodeo Drive on Wilshire, you'll find high-end department stores. On the streets parallel to Rodeo, you'll find the same kind of shops that are in upscale shopping areas everywhere. They're a good place to make a purchase and tell your friends at home: "I bought it in Beverly Hills." Aside from shopping, there are plenty of other things to do in Beverly Hills. Via Rodeo: On Dayton Way, north of its intersection with Rodeo Drive. Valet parking, but no parking charge. Take the driveway leading down to the underground garage. While it looks more like a hotel entrance than a place to park, this is actually a valet-only parking lot. Be sure to stow your receipt safely; you'll need it to retrieve your vehicle even if there's no charge. Municipal Parking Garages: West of Rodeo on Brighton Way. Underground, do-it-yourself parking. Two more city parking structures can be found on Santa Monica Boulevard.